I had planned to link up last week with Momfessionals for Show and Tell Tuesday, but then I got a three day migraine and forgot to join them. But since it's still February, I thought I'd share our love story today. I think I've mentioned a time or two that my husband and I are high school sweethearts. We went on our first date in ninth grade. I think G actually had a crush on one of my best friends, but she already had a boyfriend, and asking me out was the next best thing. We were only fifteen and neither of us had a driver's license so his mom dropped us off for dinner at a local restaurant. Throughout high school we dated off and on - mostly on. Every once in a while one of us would decide we wanted to date other people, and the usual teenage drama ensued. My poor parents. But we always ended up back together, and by the time we were seniors we were pretty inseparable. We attended the same college for four years, although we never did live together. My Catholic mama would have had a heart attack! In May of 1989 we graduated from Washington State University, and being the romantic that I am, I started expecting a proposal any day. But I waited. And went to lots of weddings. And waited. And watched friends pick out dresses and flowers. And waited. I was like Waity Katey, before that became a thing. We were both living at home with our parents, working full time, and seeing each other as often as we could. We talked about marriage on occasion, and I figured a proposal had to be coming any time now. Right? But I was still waiting. After the fifth wedding of college friends, I was getting kind of....angry and impatient. We were adults, and had been dating since we were fifteen. Obviously we knew each other well. G said he wanted to get married someday, but I was starting to think that our definitions of someday were different. In my usual "worst case scenario" fashion, I had talked myself into thinking that he didn't want to marry me at all, but didn't know how to break it off after so much time. I finally told him that if he didn't see our relationship moving to the next level, we should go our separate ways. While I was busy being difficult and ridiculous, he was saving money and researching diamond rings. G can be a man of few words, so while I was ranting and raving, he was quietly making plans, waiting for just the right time to propose. Oops. In April I planned a special dinner out in Seattle for his 23rd birthday. G was going to pick me up from work in Bellevue and we would head across the bridge and into the city. I left the store and headed outside to wait for him. He finally pulled up in a big stretch limousine. When he jumped out wearing a suit, I was speechless. He seemed nervous and a little distant. Well, this is it, I thought. He's finally going to break up with me. We stared out the windows as the driver took us into Seattle. I was waiting for the bad news, and he was about to pass out from anticipation. Suddenly G turned to me and started talking about our relationship - where we had been, what we had gone through. I was barely listening. All I could think about was how this was really the end - after eight years he was breaking up with me in the back of a limousine on his birthday. When he asked me to marry him and pulled the ring from his pocket, I was completely stunned and unprepared. A moment earlier I had been planning what to say about our inevitable break up. The poor guy had been hoping for an immediate yes, so he just stared at me, wondering why I wasn't answering. I eventually came to my senses and said yes. G had planned to propose at the restaurant, but he was so nervous he couldn't contain himself. There are no pictures or video footage, but I can assure you that the love and excitement we felt that day was worth the year of waiting. It's been almost 25 years since he proposed, and I'm still so thankful that I said yes. My husband is the kindest, most loyal man, and he would do anything for me or our boys. Only I would even think such a thing! My now-husband couldn't believe it! I think I would have been frustrated and impatient too in the same situation. Thanks for sharing! I think I had definitely put in my time :)! Ha ha! What an adorable story. 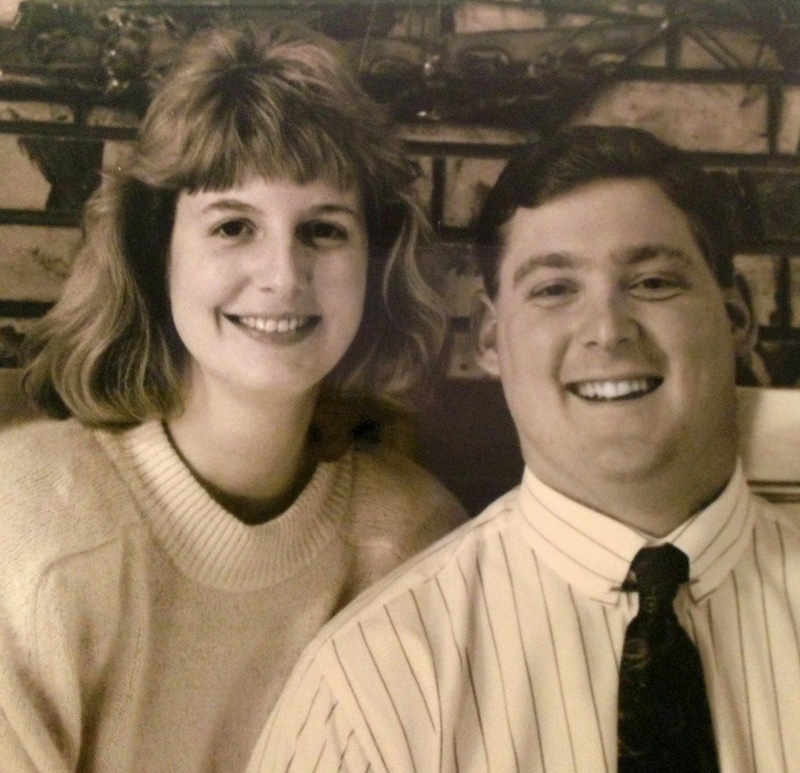 You guys have been together for a lot more than 25 years then. Congratulations! That is rare. I have some old photos of myself and my husband up on my blog today too. I loved seeing the old photos of your and your husband! This year it will be 33 years since our first date, which is hard to believe! What a sweet story! You are so funny! I always think the worst is coming too! I love seeing the photos! You are such a cute couple! Thanks Jill. I wish I could stop looking for the worst case scenario, but obviously I'm not going to outgrow it at this point! What a great story! I was a waity katey too! I cannot beleive how much your hubby looks like one of your sons. Wow! Thanks Christy. Our older son definitely looks a lot like his dad! No words. Best post ever. I love how your mind works. And those pictures!!! Aren't those pictures special? Gotta love the hair! Thank you :)! What a great story! So glad you shared! And I'm totally Waity Katy except I'm still waiting for the guy lol! Thanks Jenny! Waiting can be so hard, but it's worth it in the end, I think. I love a happily ever after. Such a beautiful story. My husband is a patient man of few words while I can be talkative and impatient. I can totally relate to the way you felt and so glad your waiting was worth your while. It was definitely worth while! What a great story! I am just about a year or so behind you. We are celebrating 24 years this year but we met when he was in the 9th grade and I was in the 7th! My daughter and her husband became "boyfriend and girlfriend" in the 5th grade and have been together ever since. They will be celebrating their 5 year anniversary this year. This is another post I didn't get. I can't figure out why but I am getting caught up! Your daughter's story is amazing - 5th Grade! I'm sorry you aren't getting my posts. I love the history you've had. And the staying power! Exactly - because then instead of a great love story he'd just be a jerk :)! Of course, no one would ever do that - I'm just cuckoo! That is such a sweet story! Enjoy reading your blog! What a beautiful love story! 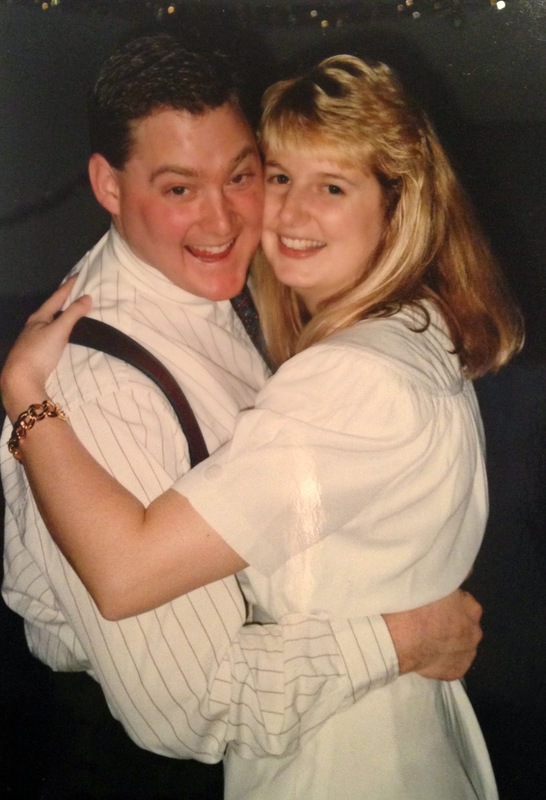 My husband and I were much older when we met! Thanks Susan. I'd love to hear how you met someday!